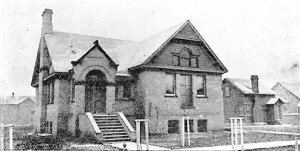 The Unitarian Church was organized in February of 1890. It was located on the corner of Ninth Street South and Second Avenue. This photo was taken in 1899 and Richmond Fisk, D.D. was the minster at the time.